REDWOOD CITY, Calif. – AGC (AGC Asahi Glass), the world’s largest producer of flat glass, has entered into a strategic development agreement with Ubiquitous Energy, the leader in transparent solar technology. 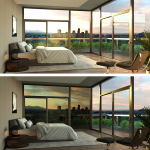 The collaboration will focus on the development of Ubiquitous Energy’s transparent and color neutral solar coating to create windows that produce electricity. Source: Hotel Okura Co., Ltd. Source: Mori Building Co., Ltd.
HAYWARD, Calif. – Kinestral Technologies, maker of Halio™ smart-tinting glass technologies, and AGC, the world’s largest manufacturer of flat glass, today announced that the joint venture companies they formed, Halio North America (HNA) and Halio International (HINT) are now open for business. HNA and HINT are the exclusive sales and service agents for Halio smart-tinting glass for the building industry. Tomy Company, Ltd. announces the international release of the Printoss, an easy printer to print photos taken on a smartphone. The Printoss will be launched from late June 2018 in 12 countries. The Printoss will be launched as the KiiPix overseas. TOMY Company. Ltd. (Representative Director: Kazuhiro Kojima, headquarters: Katsushika-ku, Tokyo) announces the international release of the Printoss, an easy printer to print photos taken on a smartphone (SRP: 3,700 En excluding tax). The Printoss will be launched from late June 2018 in 12 countries*1 in regions such as North America, Europe and Australia, and there are plans to expand sales routes into other Asian countries in future. Park Hotel Tokyo announced on April 10 that it has launched “3 Concierges of OMOTENASHI” that will showcase unique Japanese aesthetics as well as “omotenashi” Japanese hospitality starting in 2018. TOKYO, March 7, 2018 – From April, Fuji Xeroxx will sequentially roll out new services—which utilize the Company’s technologies in the fields of artificial intelligence (AI), Internet of Things (IoT) and Internet of Humans (IoH)—based on the Company’s new value proposition strategy, Smart Work Innovation. IRVINE, Calif., March 6, 2018 – Sena, the industry leader in Bluetooth communication for power sports, is teaming up with Shoei, the world’s premier motorcycle helmet manufacturer to release a joint endeavor, the SRL Communication System for Neotec II. SHOEI® Safety Helmet Corp is proud to announce the Spring ’18 arrival of the all-new NEOTEC II to the North American marketplace, as well as the specially developed, SENA-exclusive SRL Bluetooth Communication System designed for seamless integration with the NEOTEC II. TOKYO – Sakura Hotel Co., headquartered in Shinjuku, Tokyo, opened the Sakura Hotel Nippori near the historic Yanaka Ginza shopping street in Tokyo’s Bunkyo Ward, the fifth hotel in the Sakura Hotel and Hostel chain, last year. All five hotels are open 24/7 and boast multilingual staff, as 85 percent of guests are international visitors. Source: Mary Chocolate Co., Ltd.
IoT integration, futuristic design, coworking space, this hotel bring everyone’s favorite “quirky Japanese experience” to a whole new level. TOKYO, Jan. 24, 2018 – Global Agents has just announced the Grand Opening of the second in its luxury capsule hotel brand ‘The Millennials’ for March 15th, 2018. Following the huge success of their first iteration, opened last year in Kyoto, and attracting the attention from many overseas guests and medias, Global Agents is finally bringing its brand to the Japanese capital with a first location in the bustling Shibuya district. Manufactures and sells sweets such as high-grade gift chocolate Mary Chocolate Co., Ltd., is offering “Salon du Chocolat 2018″ to be held at Shinjuku NS Building from Monday, January 22, 2018 They will exhibit as strategic brand “TOKYO chocolate”. Polyplastics Co., Ltd. offers an extensive range of engineering thermoplastics which facilitate laser welding of housing components for the automotive and electrical/electronics industries. Materials such as DURACON(R) POM and DURANEX(R) PBT are highly compatible with laser welding and are finding broader end-use applications.